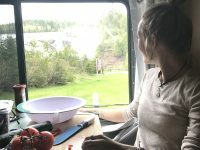 Having a small RV, regardless of the fact that my partner and I do not have any electricity or running water, has provided us with countless opportunities to explore our unique and amazing province of Ontario, and much further. This article has been written for RV enthusiasts who love spending time outdoors, surrounded by nature, exploring new trails and hikes, and ultimately hitting the road to venture to new places. Ontario is one massive province, with a variety of different landscapes and terrains, and although I may have missed a few important places throughout this compilation of Ontario’s top 10 RV destinations, I believe that these are some of Ontario’s best kept secrets and the most interesting and intriguing places to immerse oneself back into the important facets of life; adventure and nature. I’ve always had difficulty in listing things or places in mere hierarchical order, with one being ‘the best’ as we all have different opinions, perspectives, and passions. 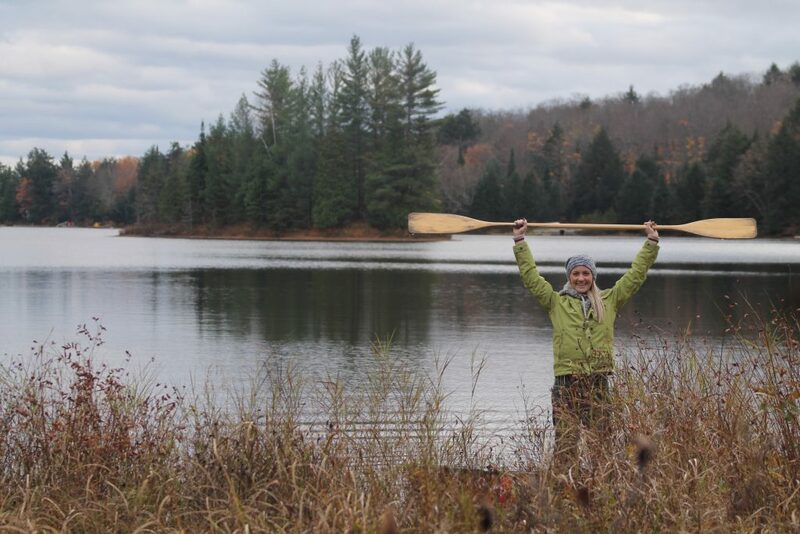 Therefore, my list is simply that, a list, of some of my favourite places throughout Ontario in no particular order. Nevertheless, it is filled with passion and love. I hope that if you have not already explored some of these wonderful places, that you do so in the near future, and if you’d like to recommend any of your own personal favourite spots, please do so in the comments below as we can always share and learn from one another. A visit to the falls and gorge located in Kakabeka Provincial Park is a must see for any Ontario resident. 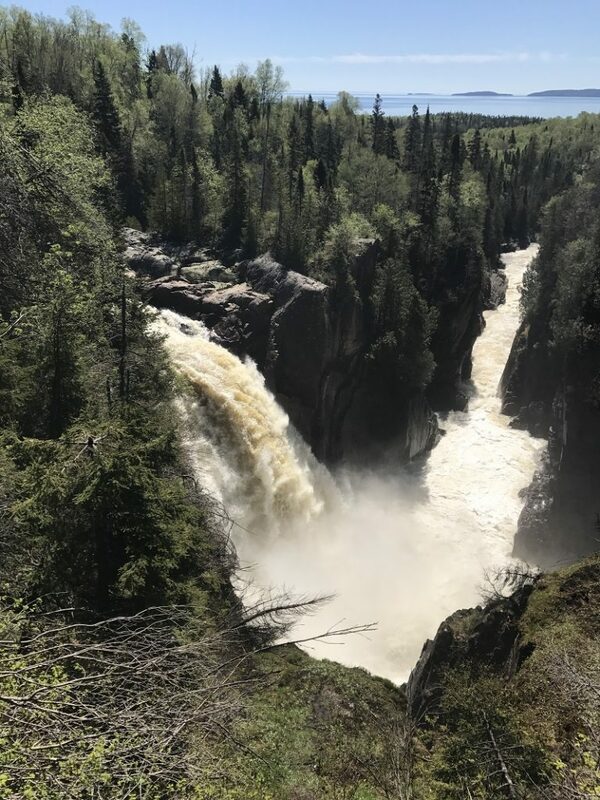 Although it’s located quite a distance away from Toronto, approximately 32km west of Thunder Bay, the falls and gorge are an absolutely beautiful site to bestow. 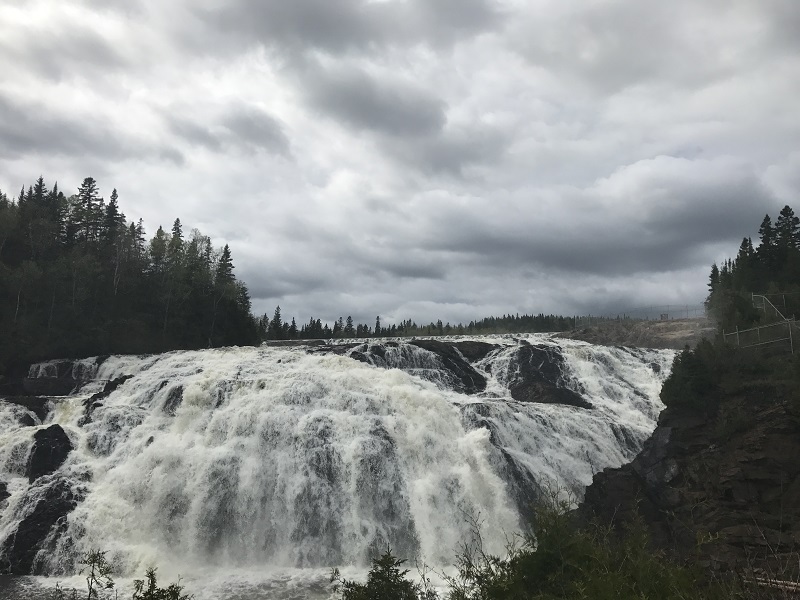 My partner and I were lucky enough to have Kakabeka Falls as a pit stop on our way travelling westward, and wow were we ever so impressed. 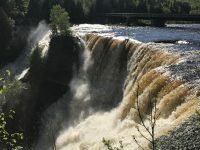 Rushing water plummets 40 metres below, passing through million years of rock face, making Kakabeka Falls the second largest waterfall in Ontario. The park is accessible all year round, and the falls are easily accessed directly from the parking lot. The parking lot is quite big and would easily fit larger sized RV’s. There is a boardwalk that wraps around the entire top of the falls and then leads to different platforms along the river gorge, so one can take in different views and perspectives of the rushing water. We enjoyed a sunny day walking our dog through the multiple different trails, and along the platforms, allowing the mist to hit and cool our faces. 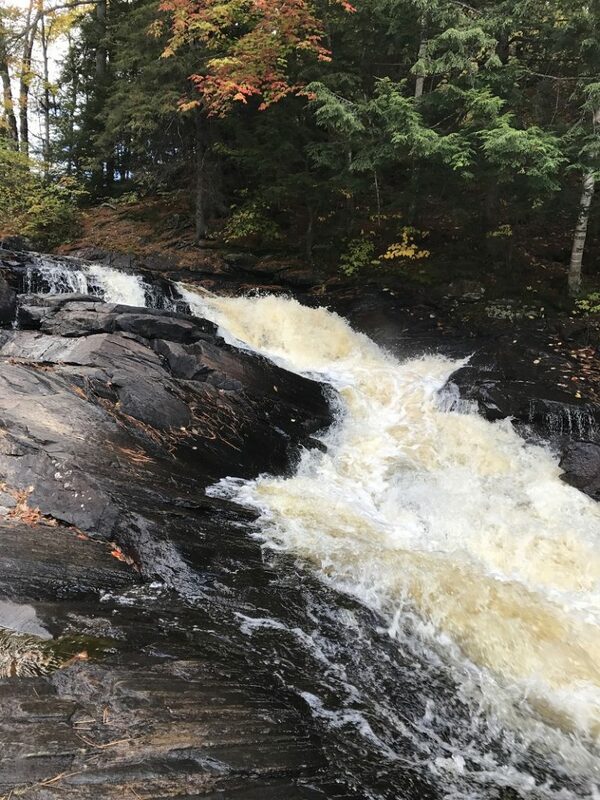 There is a small trail that leads directly down from the parking lot, and there is also a longer ‘Mountain Portage Trail’ that leads you to a small hidden set of falls within the dense forest. 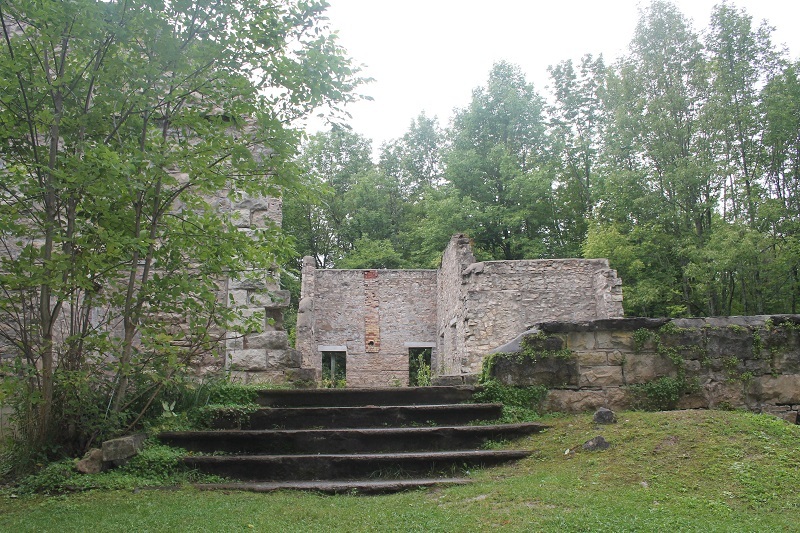 There is a deep and important local and indigenous history within this area, and there are signs located around the falls that depict the story of Princess Green Mantle. The Ojibway story tells of a young woman saving her family and village from invading Sioux warriors. Through different interpretations Princess Green Mantle leads the warriors down the Kaministiquia River to the top of the falls, and sacrifices herself to save her village. Other stories lead to Princess Green Mantle steering herself to an embankment before plummeting down the falls, saving herself, yet allowing the warriors to perish. Legend says that you can still see the shadow of Green Mantle through the mist and hear her calls through the rushing water. If you are planning on staying the night or a few nights, there are numerous campsites available from May to October. There are sites available for RV’s with options for hookups as well as laundry and shower facilities. 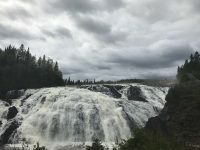 Kakabeka Falls is known as the “Niagara of the North” for good reason, its size and beauty are absolutely stunning, however, there is something calming about the absence of multiple shops, vendors, and crowded sidewalks. There is room to roam, explore, cycle, hike, and even cross country ski in the wintertime. 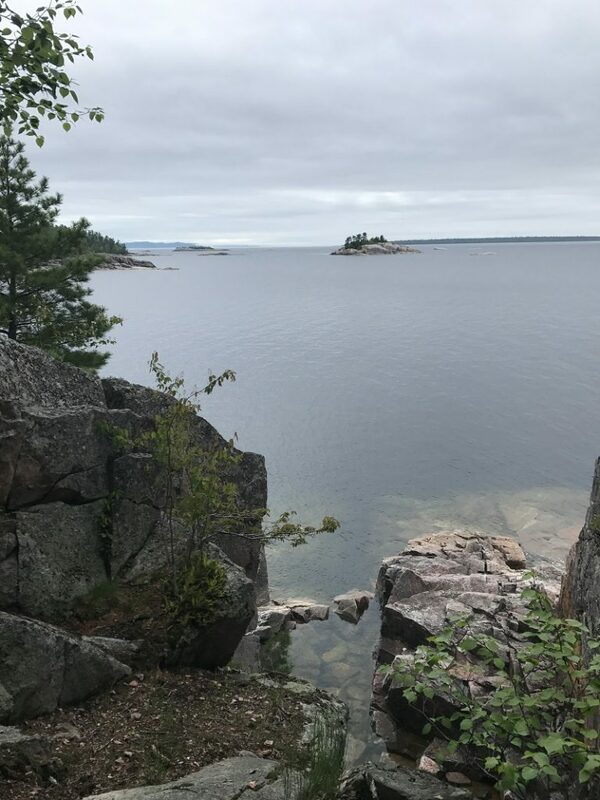 Lake Superior Provincial Park is a great place for one to explore with their RV, as it is such a diverse landscape that is rich in history, with numerous forested hills to traverse, lakes, streams, and rivers. I mean who wouldn’t want to visit the largest lake in the world? 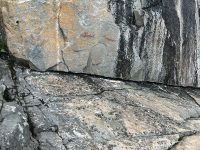 There are numerous different trails but one of the must-sees is the ancient Agawa Rock Pictographs. 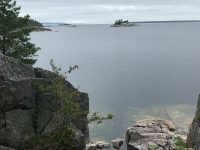 The sacred Ojibway site is best visited on a calm day as one can descend down the 98 feet rugged trail and walk along the rock ledge of Lake Superior, taking in serene views of the Lake and Agawa Bay. 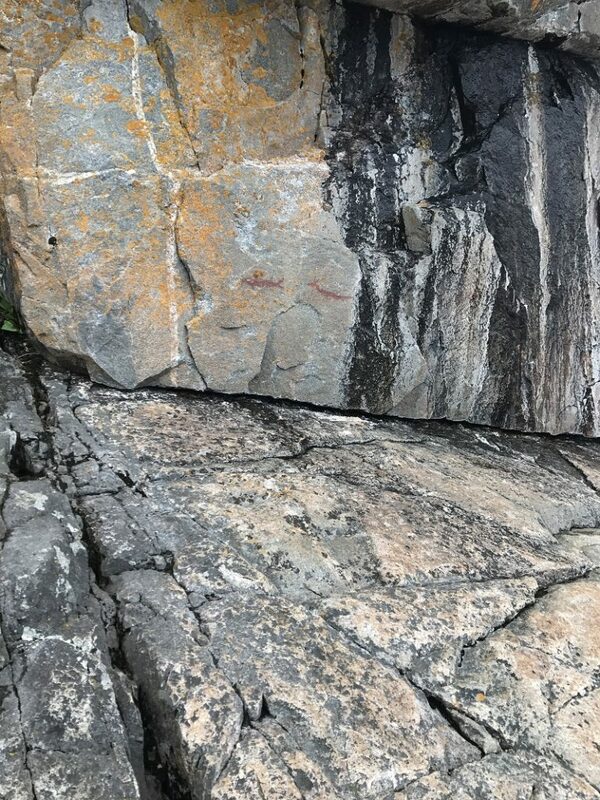 Incredibly, one can witness with your own eyes the ancient indigenous drawings of animals such as moose, deer, bear, and the horned Misshepezhieu (the great lynx and spirit of water). 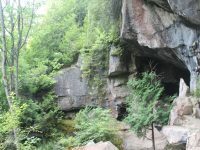 It is one of the rare pictograph sites in Ontario that is accessible by foot, with approximately an hour-long hike to complete the entire trail. Although the park office is open all year round, the Agawa Bay campground and visitor center is open from May to mid October providing diverse camping opportunities for RV’s with hook-up facilities, and a number of backcountry campsites also. 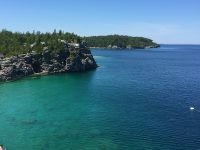 One could spend a variety of days at Lake Superior Park, exploring Agawa Bay, hiking the many trails, fishing, and canoeing. One will not get bored exploring the many different opportunities that Lake Superior Provincial Park has to offer and learning about the important historical and cultural narratives that surround this special area. There are a number of words to describe the Aguasabon Falls and gorge, words such as; wow, breathtaking, and stunning first come to mind. 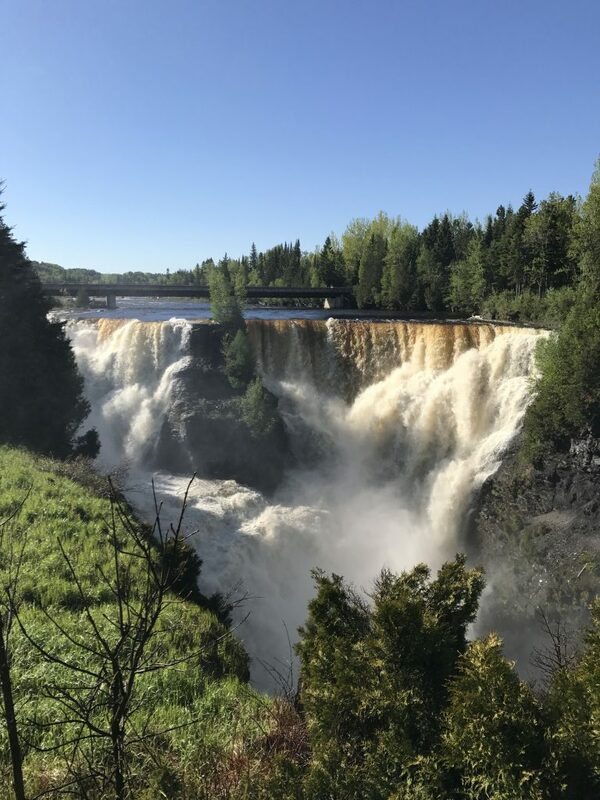 Located in the quiet and quaint town of Terrace Bay, on the north shore of Lake Superior, and in the district of Thunder Bay, there are multiple different things to explore. The 100-foot waterfall and gorge serves an important part of Terrace Bay’s history and is an absolutely amazing site to see. It is easily accessible with an RV friendly parking lot and there is a boardwalk that leads around the gorge so one can take in the amazing views of falls, 2.6 million year old fractures in the bedrock, and the endless forest that surrounds it. One piece of advice is to visit Aguasabon Falls and gorge when the water is high, we visited just after the spring run off and the power of the water rushing over the rock and plummeting below was absolutely spectacular. 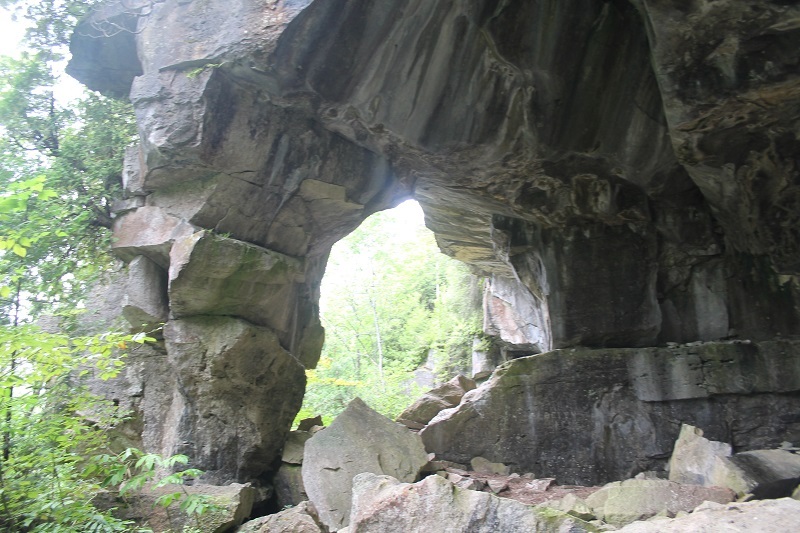 There is also an entrance to the Casques Isles trail, a 53 km intense hike. However, one can walk this trail down to the Terrace Bay Beach. The beach is extremely beautiful with a white sandy beach (there are a total of 9 white sand beaches in the area) that one can walk for miles along. There are docks for fishing, a boat ramp, and a small set of falls to sit beside and relax. While we were fishing at the beach, we had a bald eagle sit and watch fish with us for hours. 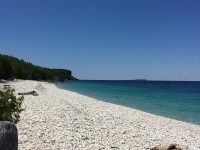 There is a volleyball court for kids and adults to enjoy, and one of the most spectacular things are the views of Slate Island Provincial Park. We were amazed to find out that there is a friendly caribou population on the Slate Islands and one can easily access the islands by boat, canoe, kayak, or even plane. We spent hours exploring the beach and local area, there is a 5-story lighthouse that kids would love to explore, and various shops and café’s. Located just outside of Wawa in Ontario is quite a spectacular set of falls. 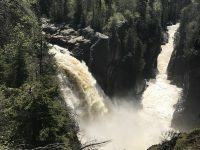 Easily accessible by an approximately 2km gravel road off the Trans Canada Highway, are two great areas to explore; the falls itself, and the lake and trails that surround it. The gravel road isn’t too rugged and should be suitable for most RV’s. In addition, the parking lot at the falls doesn’t have a lot of spots, however it would be suitable for a small RV. 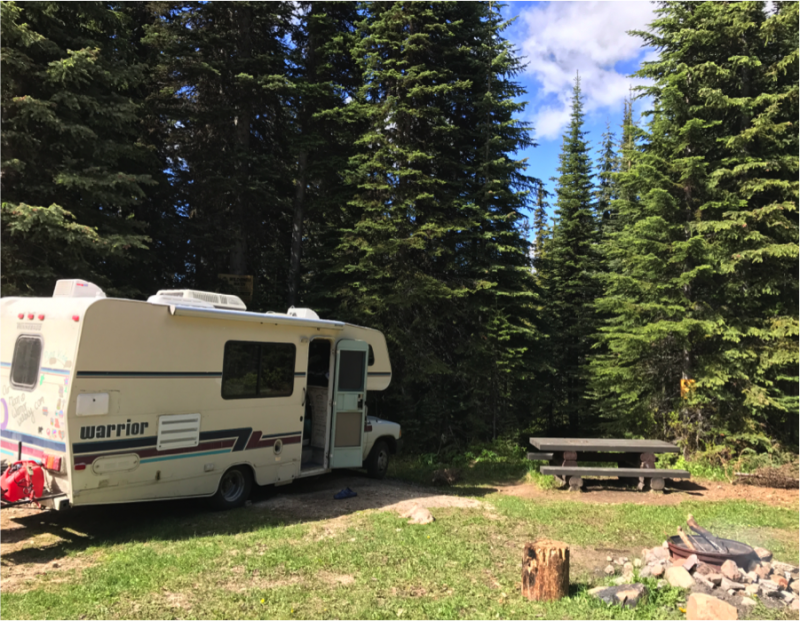 If you are travelling in a larger RV, there are different parking spots available at the lake and docks (the right hand turn at the fork of the end of the gravel road) and it would be just a short walk (approximately 10 minutes) to the falls. One can walk down onto the platform and feel the mist of the spray coming off the falls. 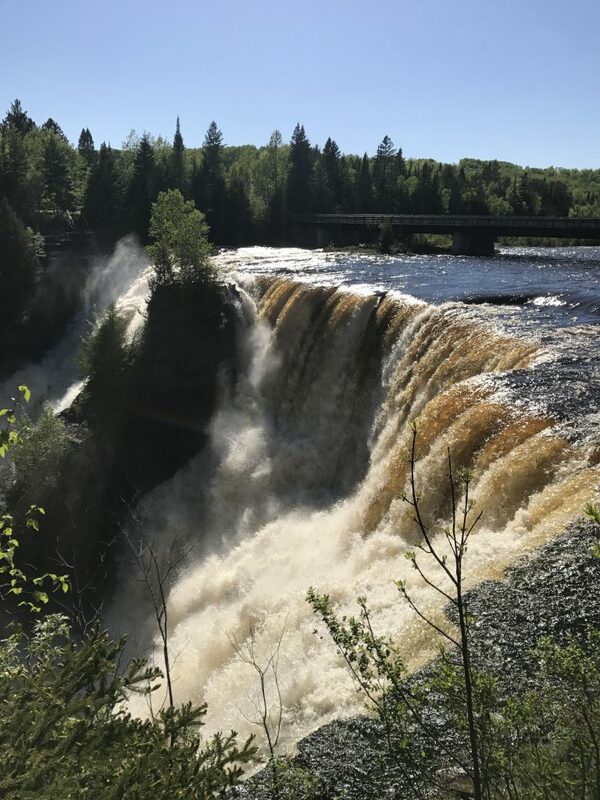 There are also a few different trail options, one trail leads up to the top of the falls, and a more intense trail leads downstream along the Magpie river gorge to Silver Falls, and finally emptying into Lake Superior. There are picnic tables located under the pavilion for families to sit and relax and have lunch as well as a bathroom on site. The lake located at the top of the falls is a great spot to fish and hangout, with an interesting trail that leads around the lake. 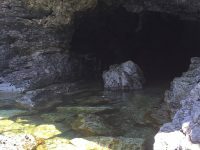 A super cool and interesting place for both children and adults to explore in the Bruce Peninsula is the Greig’s caves. There are a variety of different free parking spaces, however there is a small cash fee (they do not accept debit) to enter the caves. It is also important to know that they do not allow dogs to visit the caves, so our poor shorkie Beanz missed out on this opportunity, but spent the rainy few hours curled up in comfort in our RV. Also, good hiking shoes are highly advised and I would not recommend completing this hike in sandals or slippery shoes. One can lead a self-guided tour through the dense forest to 10 different unique limestone caves. The different rock formations are extremely interesting from afar, and upon closer inspection. We spent a few hours hiking through the forest, listening to the calls of different birds, and traversing through the rock cave systems. 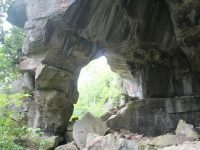 In addition, there is a smaller trail at the top of the caves that offers visitors spectacular views of Georgian Bay, looking down approximately 300 feet. Greig’s caves are open from May to Thanksgiving. We were quite shocked to learn that scenes from the films ‘Quest for Fire’ and ‘Against the Wild’ were filmed in this location. The Spirit Rock Conservation Area has been one of our favourite places to explore with our RV in Ontario. The parking lot is easily accessible and should be well suited for small to medium sized RV’s. 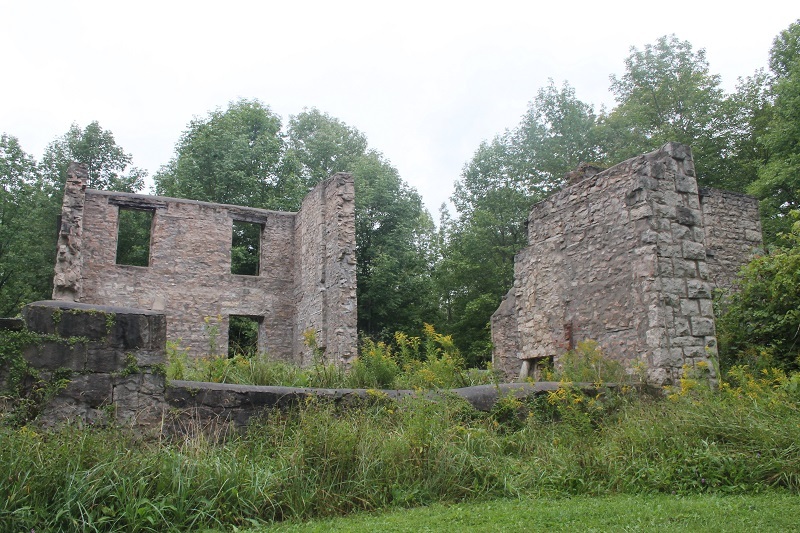 There are two different trails accessed from the parking lot, one shorter trail leads to the Corran building (a historical 17 room mansion) and then down a winding staircase to the foot of Colpoy’s Bay. The other longer trail leads you high above the Niagara escarpment and offers unique views of the different shades of water and sky. 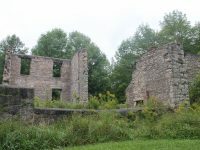 This area is a unique place to explore as it offers historical ruins, unique scenery and views, access to the Bruce Trail, and an opportunity to traverse down the escarpment and feel the water of Georgian Bay lap up against your shoes. 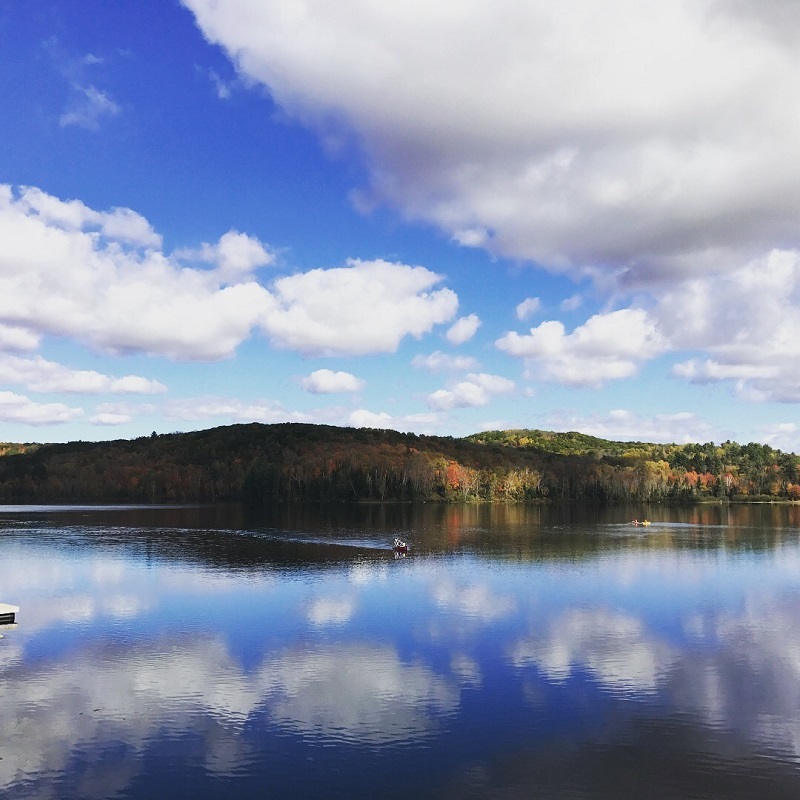 Located just a few hours outside of Toronto, the Muskoka lakes offer a wide variety of different communities, hikes, trails, waterfalls, lakes, and streams to visit. The opportunities are almost endless; however, one of our highlights is High falls, one of the largest and highest waterfalls in the Muskoka lakes region. 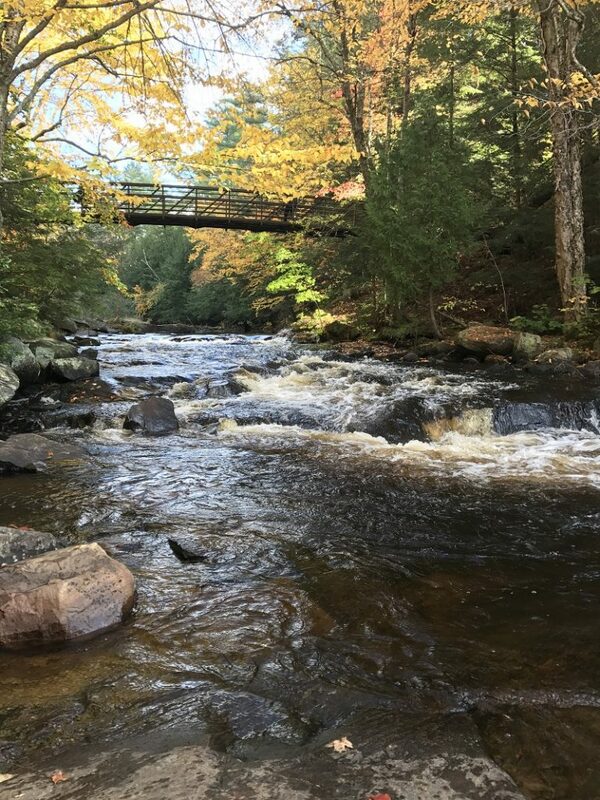 Located approximately 6 km north of Bracebridge, and easily accessible by a parking lot at the top of the falls, this is a beautiful place to explore. Although there is a dam at the top of the falls, once you walk down and stand upon the rocks along the falls, the view of the dam is blocked and you are rewarded with rushing water and views of the lake below. There is a short trail that leads down to the lake, and swimming at the bottom of the falls is allowed. You can reach the opposite side of the shore, by following the trail through the woods, crossing the bridge over Potts Falls and veering right towards the lake. 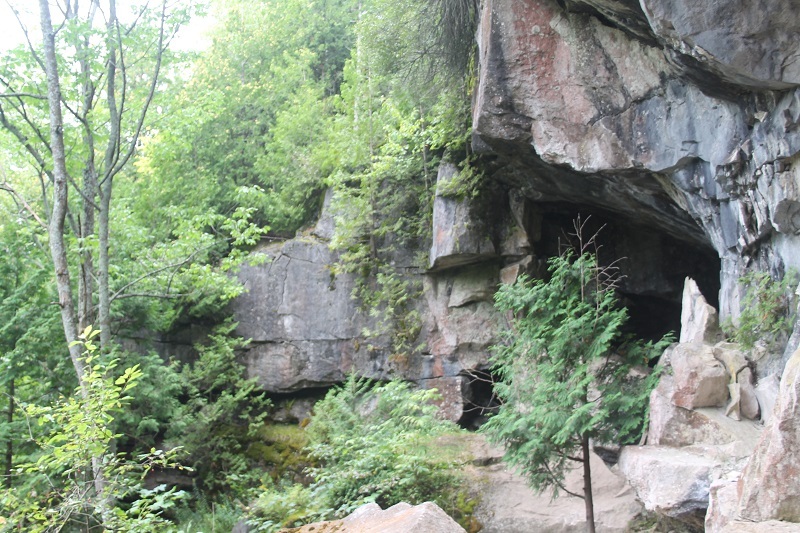 Little Falls, High Falls, and Potts Falls are all quite easily accessible from this area. There is also High Falls Bay Camping and Waterpark located on the opposite side of the lake, which can be easily driven to. This is a great camping spot for families and adults who enjoy being outside and enjoying the water. There are day passes available and discounted passes for campers to enjoy the long sandy beach, paddleboards, kayaks and canoes, and different variety of water toys. Unfortunately, I can’t believe that I don’t have a picture of High Falls. I have visited this area so many different times and obviously completely submerged myself into nature and my surroundings by forgetting to snap a pic. 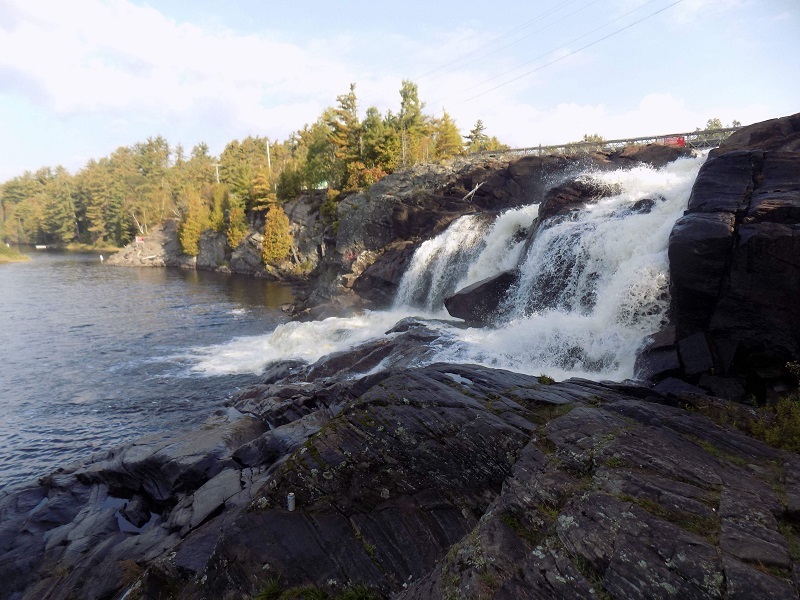 Please feel free to share any pictures of High Falls that you may have, and I guess if you haven’t already, well then you’re going to have to make the trip to Muskoka and see for your very own eyes. Algonquin Provincial Park used to be one of my favourite parks to explore as a young girl, and now as an owner of an RV, I enjoy it even more. The drive through Algonquin Provincial Park is serene and majestic. Visiting the park throughout the fall time offers visitors countless views and vistas of the magical colours of red, orange, burgundy, and more. There are a variety of trails for one to stop and explore throughout the park, varying in time, length, and intensity. Centennial Ridge is a great trail for the more avid hiker, offering spectacular views along a series of rock ledges. The Track and Tower trail is a moderately difficult hike but offers a wonderful view over Cache Lake. In addition, a good trail for spotting wildlife is the Beaver Pond trail, which is a much smaller 2km trail. While driving through the park, one never knows if they are going to turn the corner and spot a moose grazing in the marsh, a beaver hurriedly building its dam, or a heron stalking fish among the lily pads. 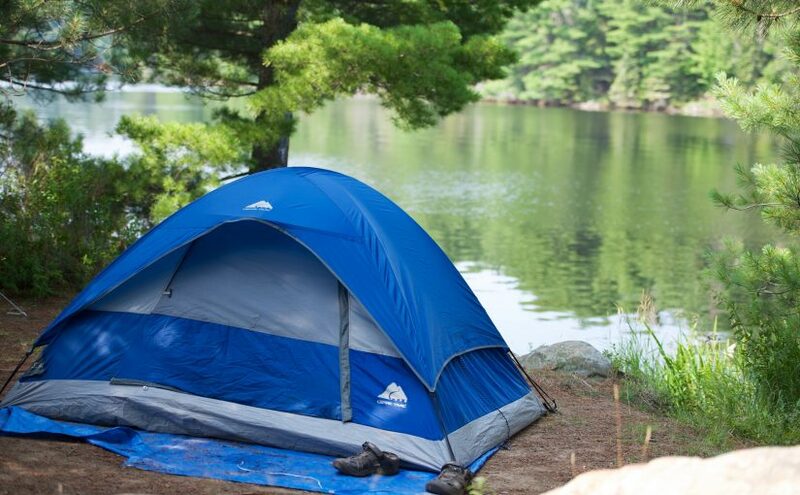 There are two main types of camping in Algonquin park; drive to camping and backcountry camping. There are a number of campsites available to RV’s with full hook-ups at Canisbay Lake Campground, Lake of Two Rivers Campground, Mew Lake Campground, Pog Lake Campground and Rock Lake Campground. Check here for more info. 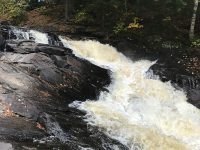 In addition, a must see on your way into the park is Ragged Falls-Oxtongue River, located a short distance away from the West gate. 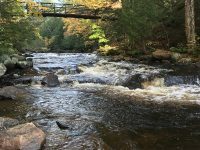 Easily accessible by parking lot for cars and RV’s and only a short hike up to the top of the falls offering wonderful views of the Oxtongue river. 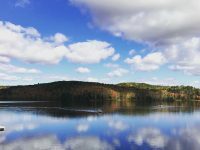 Similar to Algonquin Park, Arrowhead Provincial Park is a great place to explore during the spring, summer, and fall with its many different trails, hikes, and possibilities for canoeing and kayaking on Arrowhead Lake. Nevertheless, if you enjoy snowshoeing and cross country skiing, tubing, and skating, then Arrowhead Provincial Park may just be your winter wonderland. 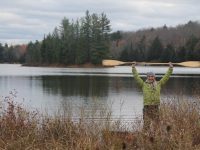 Located in Huntsville, Ontario, just a few hours outside of Toronto and with camping availabilities from May to October, Arrowhead Provincial Park is a great escape from the hustle and bustle of city life with its various different opportunities for camping in the heart of the Muskoka woodlands. 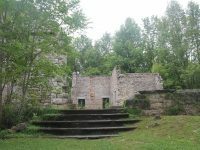 There are countless activities for adults and children, and there is a wonderful hike from Arrowhead Lake to Stubbs Falls, a beautiful cascading waterfall. There is also the option to drive and park near the falls for people who do not wish to hike. We visited during the fall and found the various colours of the leaves changing absolutely spectacular. 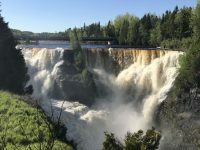 The East River Campground would be advisable for larger RV’s as they have the most sites with electricity, and it is also located closest to Stubbs falls, a must see if you are visiting Arrowhead Provincial Park. 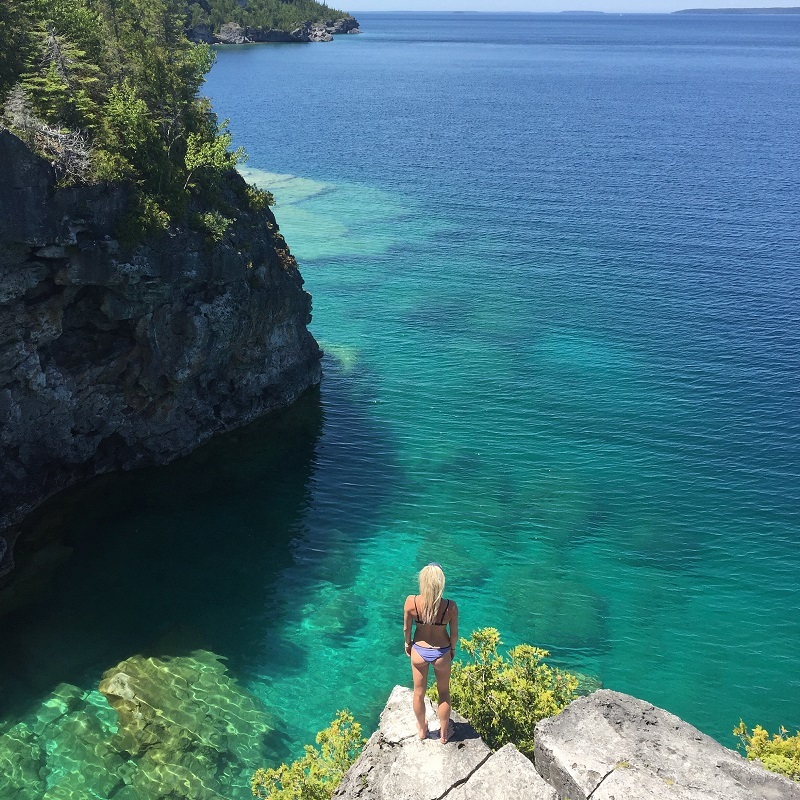 What to say about Tobermory and Bruce Peninsula National Park? A lot. One is seriously missing out if you haven’t already spent the weekend or week exploring this area during the warmer months of the year. The quant harbour town of Tobermory offers wonderful places to dine for lunch and dinner, and unique little local stores to amble through. 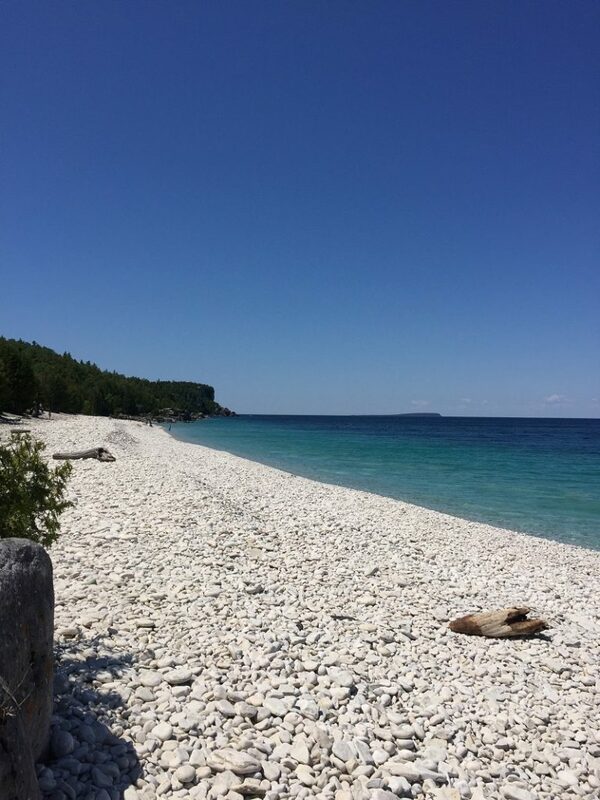 The crystal clear waters of Georgian Bay are truly magical, offering some of the best diving and swimming spots in Ontario, and possibly even Canada. Hiking trails offer dramatic views of the Niagara Escarpment, deep woodlands and ancient cedar trees. Lose yourself to the magical sounds of the birds and the ground beneath your feet as one traverse through diverse landscapes, orchids, and ferns. While I was there I stayed at the Tobermory Village Campground during the summer time and it was definitely a busy spot, probably due to its proximity and short drive to town. There are lovely washrooms and shower facilities provided, as well as a pool, and the size of campground provided was appropriate. There is also a small pond that children can paddleboat across and small go-carts for rent that you can drive around the campground in. There is also a playground for children to enjoy and also some fun outdoor gym equipment beside the beach and other smaller lake. 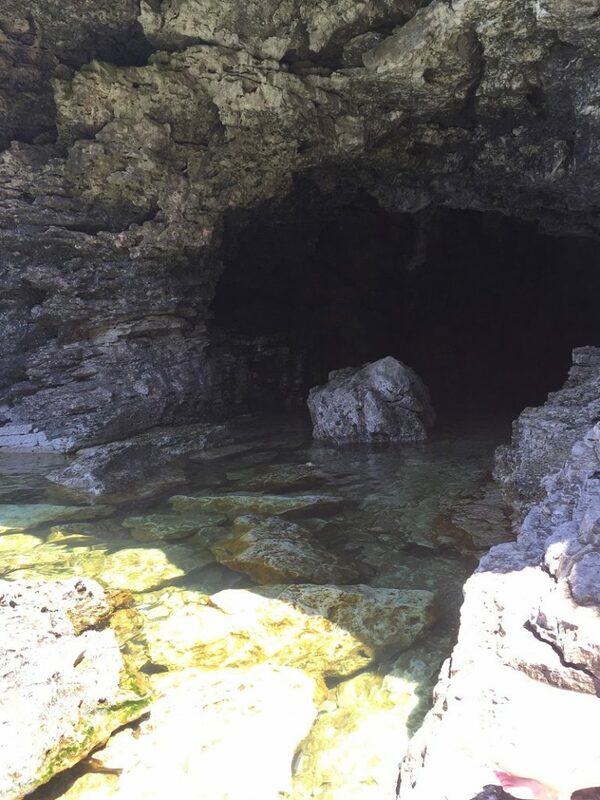 An absolutely spectacular spot to check out in Tobermory is the Grotto; world famous for its crystal clear waters and intricate cave systems. Beware though, the water is chilly, and by chilly, I mean CHILLY! If you can handle it, there is an awesome dive through the cave system in the grotto that leads the brave out to Georgia n Bay. The hike through the park to reach the grotto takes approximately 45 minutes or so. 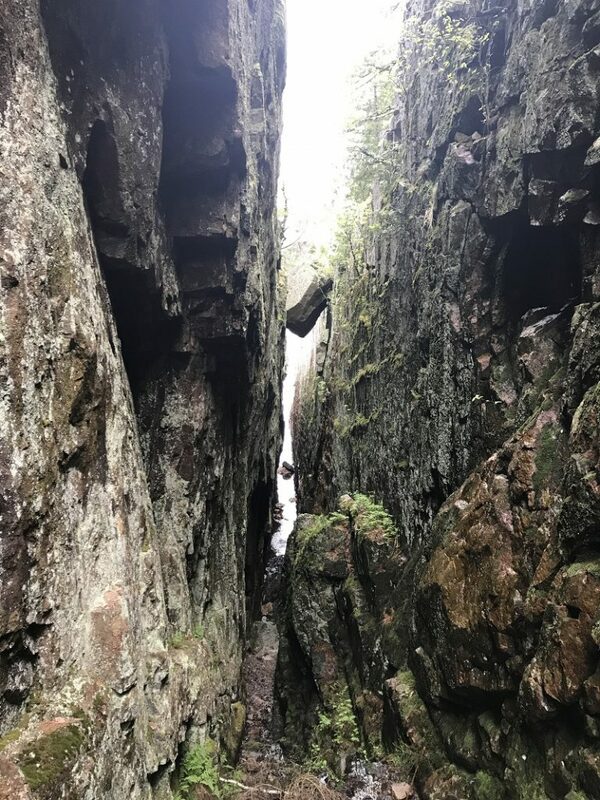 Of course there are also longer hikes available for the more avid hiker, as this trail is part of the larger 782-kilometre Bruce Trail, which just happens to be Canada’s oldest and longest footpath. Another interesting place to check out while in Tobermory is Big Tub Lighthouse. While I was there with my partner, we brought our own canoe and launched it at the Big Tub Lighthouse (although it was a little bit difficult clambering over the rocks) and canoed right over a number of different shipwrecks, watching for scuba divers as we paddled. 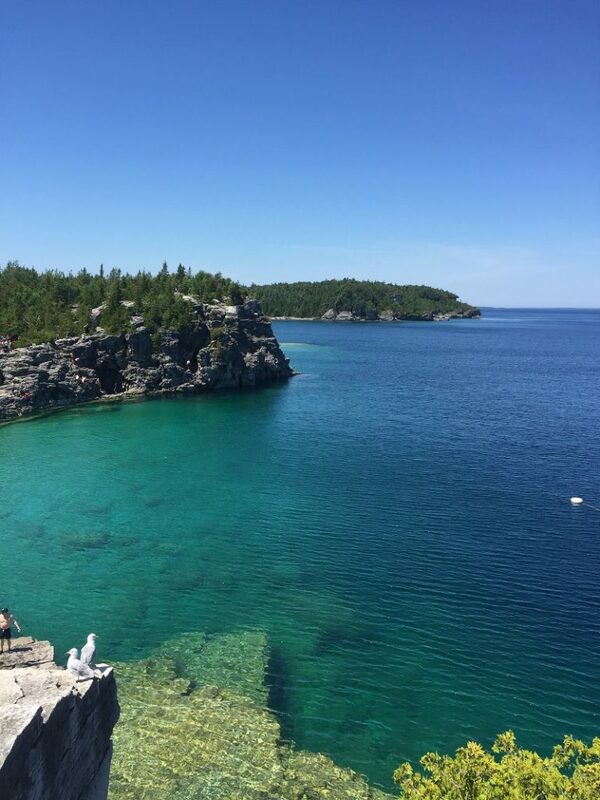 Lastly, one cannot go to Tobermory and not visit Flower Pot Island and Fathom Five National Marine Park. 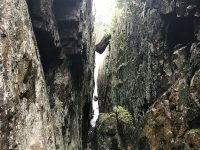 Located 6.5 km from the harbour in Tobermory, and is only accessible by boat, the island is truly a stunning place to explore, famous for its unique and stunning “flowerpot” rock pillars and caves. One can spend half a day or the entire day exploring the island, swimming and snorkelling, and taking in the wonderful scenery. Of course it is not absolutely necessary to own or travel in an RV to enjoy these variety of different destinations in Ontario, one can visit with a car, or decide to tent camp of course for any number of days. Nevertheless, there is something humbling and personable about being able to travel with one’s possessions, and essentially one’s ‘home’. 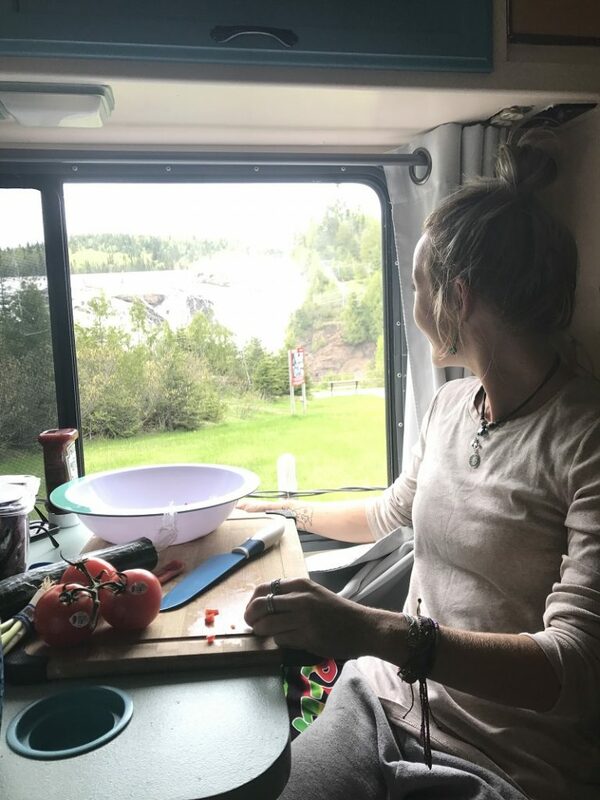 Being able to duck inside out of the rain to cook lunch or dinner, or to curl up with a book at night in one’s own RV in the middle of the forest or next to a rushing waterfall is truly something special.